As developers, we know that selecting the best stack for the job is never easy. That’s why we at Contentful have been working hard to give you The Example App — a series of reference applications that walks you through the basics of Contentful. How can I realize my project with Contentful? How do I get started using my favorite language? By experimenting with The Example App, you will learn how Contentful’s content infrastructure is ideal for your next project and how you can write an app that works to retrieve content from your space in Contentful. The Example App has introductory examples for how to build an application with Contentful using .NET, Java, Node.js, Ruby, Python, PHP, Kotlin, and Swift. Content modelling is the practice of structuring your content. At Contentful, you do this by creating content types. The Example App features a thorough lesson on how to build a content model to fit your project. You can even get a working example of Example App to-go on your Android device as well as for iOS on the App Store. Contentful follows an API-first approach, which means that all of its functionality is provided by APIs. With our Example App available in so many languages, you can choose to dive into developing a mobile-first solution to retrieve and serve your content. Let’s say you wanted to develop for Android — our GitHub repo provides you with everything you need to load into your Java SDK. However, Java is legacy for building Android apps at this point and Kotlin is the future. Kotlin comes recommended by Google for writing Android apps since it’s a less verbose, concise language than Java. What do you do now? Lucky for you, we’re always striving ahead to support all sorts of (modern) ways for you to work and we’ve got you covered with a repo for The Example App in Kotlin! The Android version of The Example App is written in Kotlin and will be what the app would look like out-of-the-box from the GitHub repo; development of a variant of the Example App that uses GraphQL is also underway. With the app on the store and source code on GitHub, you can very easily learn how to combine new tech such as Kotlin, architecture components, and more to be integrated into your app using Contentful. While theory is great, nothing beats learning from code examples. Head over to Contentful’s GitHub page to find The Example App’s GitHub repo in the language of your choice, and start modifying our examples to your liking. 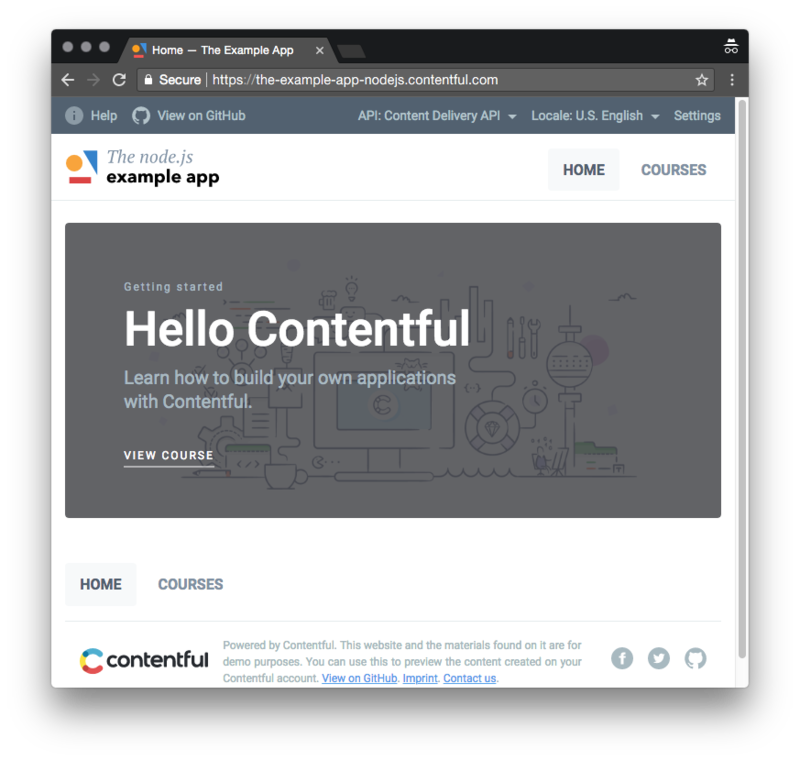 If you’re looking for a higher-level overview to get your bearings and go in the right direction, we also have this foolproof guide on how to get started with Contentful that you can check out before progressing to the Example App.